Rideshare and grocery delivery services are growing in demand across Pennsylvania. Uber, Lyft, Instacart, and Shipt have become popular household names as more individuals rely on them to simplify and streamline their life. With more than 29% of workers having a second job these days, many of them choose these popular side hustles as a way to make some extra cash. The ability to set your own hours and high demand are the two biggest attributing factors to the popularity. Before deciding to join one of these growing companies, there are few things you should understand first. The most important one being, are you protected under your current auto insurance policy? There are two exclusions in most auto insurance policies that limit coverage when driving for one of these companies. One common exclusion is listed as driving for hire. Most insurance companies exclude coverage if you use a vehicle to transport individuals or products for a fee. 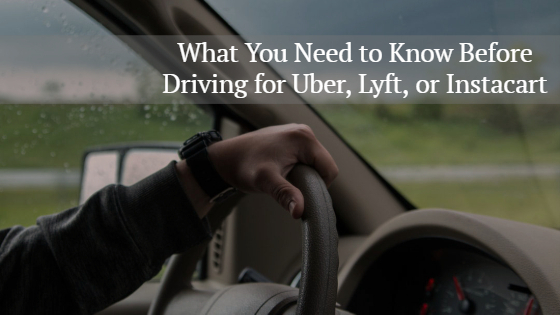 Since rideshare and grocery delivery services pay you commission for making deliveries or transporting individuals, there would be no coverage if you were involved in an auto accident. Another common exclusion is using your vehicle for business purposes. By accepting payments for making deliveries and driving individuals, you are in business for yourself. No coverage would be available if you were involved in an auto accident while using a vehicle for one of these side gigs. Ridesharing services including Uber and Lyft offer insurance coverage once you’ve accepted a ride request and during transit. However, there is no insurance while you are waiting for a ride to be assigned. Unlike Uber and Lyft, Instacart and Shipt don’t offer any auto insurance coverage for shoppers, leaving you to be fully responsible for coverage. The best way to fully protect yourself while on the road is to purchase a commercial auto insurance policy or rideshare policy to fill the gaps. Commercial insurance will cover liability and property damage expenses that arise from an auto accident that you are found responsible for. Contact your local insurance agent today to discuss available options for rideshare and grocery delivery coverage. If you are looking for a local agent in Pennsylvania, contact the team at Rumbaugh Insurance. Our agency is located in Hanover PA but services all surrounding areas including Northern Maryland.